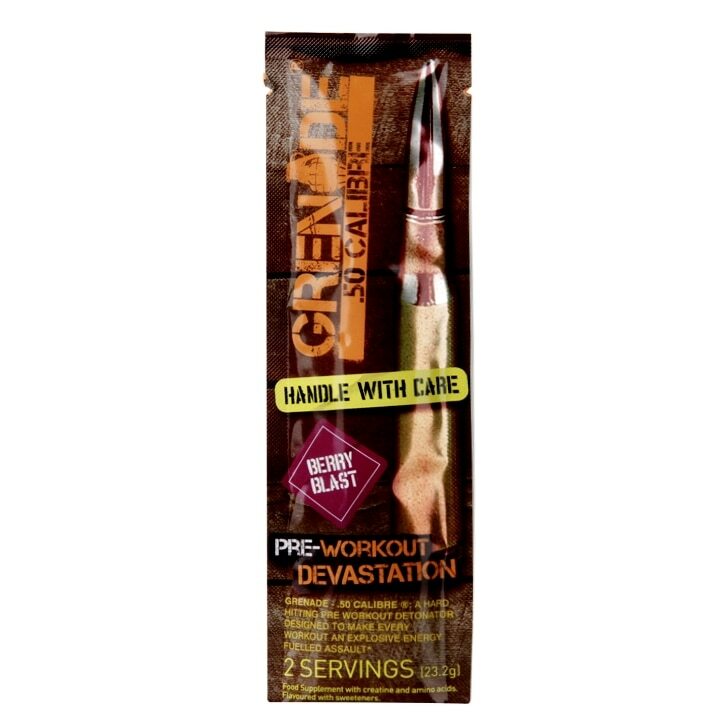 Grenade .50 Calibre Pre-Workout Berry Blast is rated 3.7 out of 5 by 11. Rated 5 out of 5 by Tapie from BEN I bought it a month ago and I was very happy with the product. Rated 1 out of 5 by Connor16 from Doesn’t work for me Obviously everybody is different and this will effect everyone different, but I found it was a poor pre workout.. it tastes disgusting and turns carbonated when mixed which I find hard to drink right before a workout, it also just made me feel really bloated and had not explosive effects at all, I could of literally gone to sleep after using 2 scoops. I preferred the optomimum nutrition pre workout as I found the effects of that actually worked, each to their own though.. Rated 2 out of 5 by Sim_d from Poor I've only tried 1 pre workout before but this one is about 5 times less efective. Besides, it made my sleep very bad . Rated 5 out of 5 by Anonymous from Bombs away! I for a long time needed some sort of boost of energy finishing late at work and going straight to the gym after to do a late weight session i was drained but still pushed myself to get in the gym. I then thought i cant carry on like this feeling totally drained and fatigued my workouts were suffering i would finish up and go home annoyed that i cant give my best because of being totally drained. With Grenade 50 calibre it has given me an unbelievable difference once taking this you will feel an energy that will give your weight lifting workouts a massive boost. I break my pb after pb on each exercise easily when using this. defo 5 stars from me.